Did you know 61% of your skeleton is made up of L-Glutamin? This making Glutamine the most common amino acid found in your body. This may make you wonder if contain so much L-Glutamine in our body already why do I need more? Well, during intense training or someone who lives a very active lifestyle glutamine levels are very depleted, which decreases your strength, stamina, and recovery! Not to mention it could take your body up to 6 days to replenish your glutamine levels back to normal. 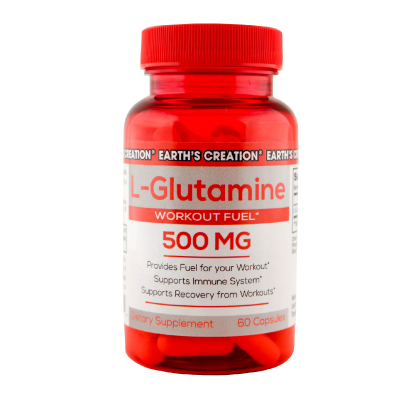 L-Glutamine also plays a big part in protein synthesis. Studies have shown that L-Glutamine supplementation can minimize breakdown of muscle and improve protein metabolism. How does L-Glutamine Benefit you? Glutamine is a key component in protein metabolism, cell volumizing, and anti-catabolism. It also increases your ability to secrete Human Growth Hormone, which helps metabolize body fat and support new muscle growth. Also due to Glutamine’s anti-catabolism ability it prevents the breakdown of your muscles. L-Glutamine is especially useful for those who are looking to cut down without losing muscle. Glutamine is essential throughout your body for ideal performance. Your small intestines require the most Glutamine in your body. Your immune system also needs Glutamine because Glutamine levels deplete during workouts. This is why L-Glutamine is so important for your body, not only to gain and keep muscle, but for the overall maintenance glutamine does in your body!